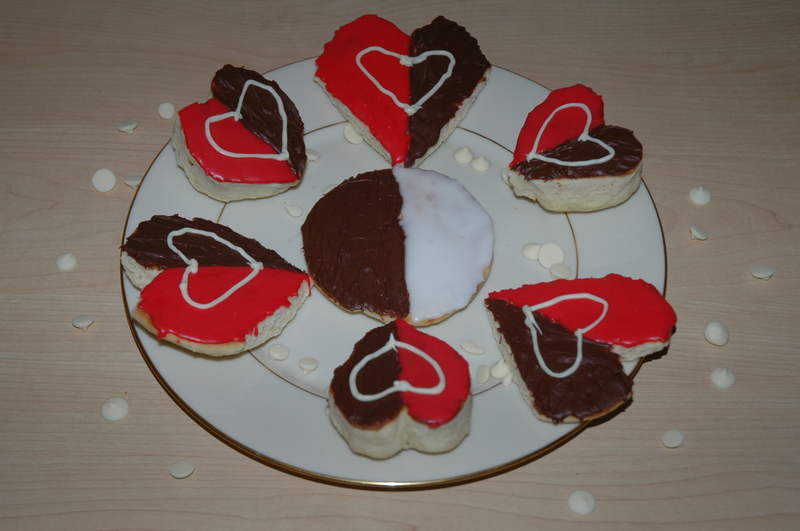 It’s Valentine’s Day in a few days and I’ve been wanting to share a post for Black and White cookies, so I made a few changes to have them fit the holiday. These are easy to make and tasty too. As I wrote this post I noticed that Paula Deen’s original recipe got a lot of negative comments but I didn’t have the same problems and I’m glad when I printed the recipe there weren’t any comments yet or I might never have tried the recipe. I wanted the cookies to have a heart shape, so I tried two different methods to have the cookies turn out that way. I first tried to make heart shaped molds out of heavy duty aluminum foil but although the shapes looked okay, the cookies turned out more like biscuits because I made the molds too small so the cookies were too thick (that didn’t hurt the taste any though). For some of the cookies, I cut the round shapes to have a point at the bottom and a divot at the top. Do you like the look of the smaller and thicker molded cookies or the cut cookies? Step 1: Mix together flours and baking powder in a medium bowl. Using an electric mixer beat together the butter and sugar until the mixture becomes lighter in color and is thoroughly mixed. Step 2: Incorporate eggs into the butter mixture individually at medium speed until each is well incorporated. Add milk and vanilla and beat until incorporated. Step 3: Preheat oven to 375 degrees. Prepare cookie sheet by covering it with parchment paper. For regular Black and White round cookie shape, drop heaping tablespoonfuls of dough on the prepared cookie sheet. For heart shaped cookie molds, place the molds on the prepared cookie sheet and drop the heaping tablespoonfuls of dough into the molds while ensuring that some of the dough will fill the entire shape. Space cookies at least 2 inches apart and bake for 15 minutes. Let cool completely before icing. If cutting the round cookies into a heart shape, cut the rounded edges from the sides to a point at the bottom. Then cut a divot or “v” at the top of the circle. Step 4: Prepare the icing by mixing the powdered sugar and water (as needed) together in a medium bowl. The icing should be spreadable but not thin. If tinting the icing for Valentine’s Day, add 20 or more drops of red food coloring until the icing becomes a nice shade of red. The flat side of the cookie will become the top for these. Spread the icing on half of the flat side of each cookie. Step 5: Break the chocolate candy bar into small pieces and melt in a double boiler or the microwave. If using the microwave, melt the chocolate in small increments and stir before additional heating until it’s of spreadable consistency. Spread the chocolate on the other half of the flat side of each cookie. Let icing and chocolate set. Step 6: If using the additional garnish, melt the white chocolate in a double boiler or the microwave. If using the microwave, melt the white chocolate in small increments and stir before additional heating until it’s of spreadable consistency. Spoon the melted chocolate into a ziploc bag and snip the corner, making a small hole for piping. Pipe heart shapes in the middle of each heart shaped cookie. Storing: Store cookies in a sealed plastic container. Recipe adapted from Paula Deen on foodnetwork.com. This post may also be entered in the following linky party. Click the button below to see the other great posts in the blog hop. This entry was posted in Cookie, Dessert and tagged chocolate, cookie, Valentine's Day by Annamaria @ Bakewell Junction. Bookmark the permalink. I’ve never made or even eaten a black and white cookie. I know, right?! I’ll let you get over your shock before commenting on how adorable your cookies are. Perfect for Love Day…or any day, really! Thanks for stopping by. These cookies are pretty easy to make and are a bit more cake-like in texture. I bet you’d love them. I’m with you on the thinner cookies. My husband loved the thicker ones. Thanks for stopping by. I’ll stop by your blog party too. I’m a big fan of ‘black & white’ or ‘red’ cookies. Thanks for sharing this with Foodie Friends Friday Valentine’s Day Sweet Treat Party. I’ve pinned and shared. Thanks so much for pinning and sharing. I’m a pretty big fan too. G’day and how cute! I could go for one right now! Thanks for stopping by. So glad you liked them. Very cute! Thanks for sharing at Tasty Tuesdays! Pinning to the party board and can’t wait to see what posts you share next week! Have a terrific week! Thanks. So glad you liked them.